A drug vacation may give you an opportunity to learn whether you really need to continue taking this drug or not. This will give your body an opportunity to manifest its everyday self-regulating and propensities. It may be time to go on a special type of vacation: a drug vacation. * A drug vacation is a time in which you reduce the doses or eliminate entirely whatever drug or drugs you are taking. A drug vacation may give you (and your doctor) an opportunity to learn whether you really need to continue taking this drug or not. More important, this vacation will give your body an opportunity to manifest its everyday self-regulating and self-healing propensities without the crutch of a pharmaceutical agent inhibiting or suppressing its important work. IF you are ready, step away from the medicine cabinet. You may not even recognize it, but you may be addicted to one or more of the drugs there. It may be time that you received an intervention, though this time, you should probably intervene on yourself rather than have anyone do it for or to you. You may have noticed but your body has become accustomed to these drugs, and you've probably have had to increase the dosage over time, though you probably also noticed that various weird symptoms emerged when you did so. You then probably chose to increase it on some days and decrease on other days, in the hopes that they will still work, though some people may wonder if they are really helping or not. You've probably also experienced other symptoms and syndromes for which you've been encouraged to take additional drugs. If you're smart enough, you're wondering what interactions the drugs have. Your doctor has told you that "there are no problems" taking two, three, four or five medications together, but he cannot point to ANY research that has ever studied that question. In any case, with the increased number of pills or the higher dosages, you, like Alice in Wonderland, may seem to be walking twice as fast but remaining in the same place (or are going backwards). Over the years, you're probably noticing that you are having decreased amounts of energy, increased anxiety or depression, new symptoms, including some real strange ones, and in general, you're not feeling like your "old self." Put down that aspirin, acetaminophen, or other pain medication. Don't open that bottle or box of allergy medication, sleep aid, headache drug or whatever and step away from the medicine cabinet. The logic and wisdom of "unplugging" from various stressors in your life is that there is an inherent intelligence of our bodymind that continually strives to defend and heal ourselves. Living systems have certain innate self-organizing and self-healing propensities, and unplugging is simply an important strategy that enables your bodymind to work its every-day magic as it manifests its magnificent survival strategies. Sadly, many of us are so arrogant that we think that we are smarter than our own bodies. We think that we can do better than what nature has provided us. The idea that we can or even should "conquer" nature is so 19th century. Some people today actually think that our bodies are not very smart and that we could and should overcome its weaknesses by the use of pharmaceutical agents that can rid the body of its symptoms. The fact of the matter is that our symptoms are our body's best efforts to defend and heal ourselves from infection, environmental assault or any type of stress. Drugs that suppress our symptoms may provide short-term benefits, but they usually inhibit our own self-healing and self-regulating functions. Ultimately, from a purely pharmacological point of view, drugs do not have "side effects." Drugs only have "effects," and we arbitrarily differentiate those effects of the drug that we like from those that we don't like (and we then call these latter symptoms the "side effects"). The lesson here is that just because a drug is effective in getting rid of a symptom does not necessarily mean that this treatment is truly curative, and in fact, the elimination of the body's symptoms may cause more long-term harm than good. The basic assumption behind the broad field of natural medicine is that the human body has an inherent wisdom within it that strives to defend itself and to survive. Symptoms of illness are not simply something "wrong" with the person, but instead, symptoms are actually responses and efforts of the organism to defend and heal itself against infection and/or stress. Hans Selye, M.D., Ph.D., the father of stress theory, once asserted, "Disease is not mere surrender to attack but also the fight for health; unless there is a fight, there is no disease." Our human body has survived these thousands of years because of its incredible adaptive capabilities, and one of the ways that it adapts is through the creation of symptoms. Whether it be through fever and inflammation, cough and expectoration, nausea and vomiting, fainting and comatose states, and even the variety of emotional and mental states, each symptom represents the best efforts of the bodymind in its effort to fight infection and/or adapt to physical and psychological stresses. Although symptoms may be the best effort of the organism to defend itself at that time, it is not usually effective to simply let the body try to heal itself. Most often, some treatment must be provided to help nurture, nourish and augment the body's own wisdom. The challenge to physicians, healers and patients is to determine when to help aid this inner wisdom of the body and when to intervene to make certain that the body does not harm itself. The word "symptom" comes from a Greek root and refers to "something that falls together with something else." Symptoms are a sign or signal of something else, and treating them doesn't necessarily change that "something else." Ultimately, a symptom is a signal, a warning light that something is off-balance. It is akin to an oil warning light in your car. Although this light will go off if you unscrew the lamp, this simple action doesn't solve the more complex problem that led to the light turning on in the first place. Concepts in new physics offer further support for the notion that living and non-living systems have inherent self-regulating, self-organizing and self-healing capacities. This ongoing effort to maintain homeostasis (balance) and to develop higher and higher levels of order and stability have been described in detail by Nobel Prize-winning physicist Ilya Prigogine in Order Out of Chaos, Fritjof Capra in The Turning Point, and Erich Jantsch in The Self-Organizing Universe. In systems thinking, "perturbations" are understood as efforts of a system to re-establish balance and to increase its complexity so that there is greater dynamic homeostasis. Please know that I am not "Pollyanna-ish" about the wisdom of the bodymind. In other words, as much as I respect the innate intelligence of the human body, I also recognize its limitations. Although the human body has magnificent self-regulating, self-healing propensities, it is usually not enough to "let the body heal itself." Usually, one needs to nurture and nourish the wisdom of the body. Various naturopathic strategies and homeopathic medicines help to augment this wisdom. The fact that homeopathy has been called "medical biomimicry" and "medical aikido" helps us to better understand why it is so effective. By using a medicine to mimic the body's own wisdom, the body is better able to defend and heal itself. It is no coincidence that two of the very few conventional medical treatments that augment the body's own immune system are immunizations and allergy treatments, and these drug treatment modalities "coincidentally" derive from the homeopathic principle of similar (treating "like with like"). However, in order for naturopathic and homeopathic medicines to work most effectively, it is sometimes necessary to diminish or eliminate those drugs that suppress symptoms and thereby inhibit the body's own self-healing tendencies. Is it time that you took a vacation from your medications? In so doing, you may finally be giving your body an opportunity to express its own defenses and to heal. * I am primarily referring to taking a vacation from over-the-counter drugs, but if you're taking prescription drugs (Rx), I suggest you to talk with your doctor about creating a plan to diminish the doses of whatever drugs you're taking, with a goal of stopping the medication(s) for a period of time, if possible and appropriate. Dana Ullman, MPH, is America's leading spokesperson for homeopathy and is the founder of www.homeopathic.com. He is the author of 10 books, including his bestseller, Everybody's Guide to Homeopathic Medicines. 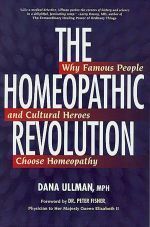 His most recent book is, The Homeopathic Revolution: Why Famous People and Cultural Heroes Choose Homeopathy (the Foreword to this book was written by Dr. Peter Fisher, the Physician to Her Majesty Queen Elizabeth II). Dana lives, practices, and writes from Berkeley, California.